An attempt to have brunch at a Cajun eatery a couple of weeks ago had to be aborted. We arrived there just past the opening hour (1 p.m.), and we were told by the hostess that they would not seat us for another hour due to a staff shortage. I asked to speak to the manager, and he reassured me that it was going to be a 10-minute wait. While sitting at the bar while the restaurant was half empty, we struck up a conversation with a young couple who were equally as perplexed as we were, and they relayed that they had heard that it was the chef’s second day on the cooking line. Upon hearing this, my friend and I looked at each other and quickly hauled our behinds out of that joint. 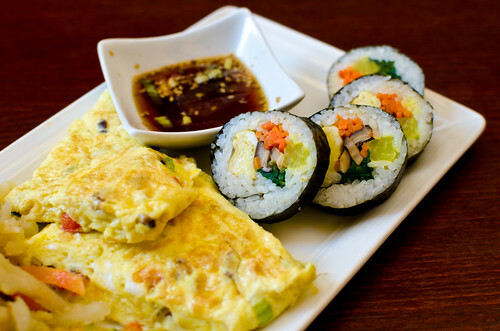 Just a block down is Mandu, a Korean restaurant that serves traditional cuisine in a modern setting. Most Korean restaurants that I have frequented are usually located in remote warehouse areas, or in little “Koreatowns” in the suburbs, where English is the second language judging by the retail signs and advertisements. To stumble across one in the heart of the city, Dupont Circle, is definitely a rarity and a pleasant surprise. My dining partner had noticed their $12 lunch special on his way to the first locale, and we decided to give Mandu a try being that it was getting to be way past my meal time (hypoglycemia is nature’s most infallible meal clock). Stepping in the restaurant, you do not get the impression that it is a typical Korean eatery due to the rather modern ambience and the multi-cultural staff. Having visited this place in its previous life as a Himalayan restaurant years ago, I knew there was a second floor with beautiful lighting and it was more spacious than the bottom floor. We planted ourselves at a table under the skylight and proceeded to order. 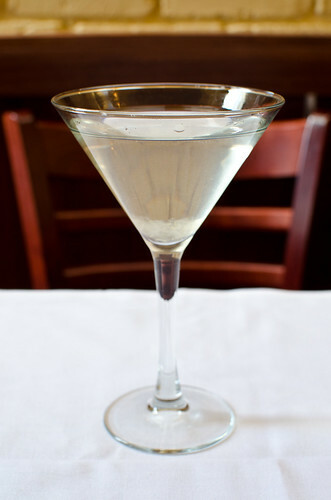 We decided to begin the meal with a house libation – Soujutini. It is made with a Korean distilled liquor and an assortment of juice flavors – aloe, grape, mango, peach, pineapple, orange or yogurt. I ordered mine made with aloe juice since I love this stuff, which I get regularly from my Korean grocer. The liquor had a kick to it while it provided a rather strong grain alcohol note to the sweet juice. My friend’s version was made with yogurt which was interesting, and according to him, it tasted a bit like medicine – not quite Bailey’s Cream here. We decided to order a traditional appetizer, Mandu or Pot Stickers. This place offers a variety made with Shrimp, Beef & Pork, or Vegetable. The kitchen was flexible enough to allow me to order a couple of each type, which is not common in most Korean eateries. The plate arrived with the potstickers lightly pan-fried after a short boil. The dough was quite al dente but not overly so, and the different fillings were discernable. 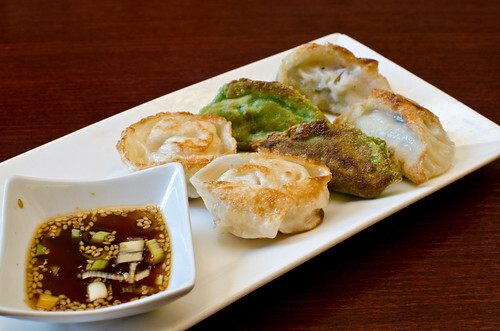 The accompanying dipping sauce provided the soy-saltiness and rice-vinegar-sourness to these dumplings – a good start. 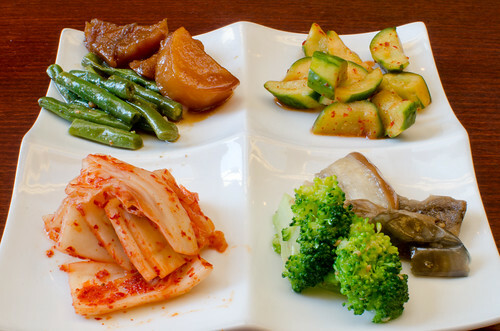 My favorite part of a Korean meal is the array of pickles and cold vegetable dishes that are customarily served with the main course. Ours arrived with the omnipresent Kimchi pickles, eggplant and broccoli, pickled cucumbers, and marinated potato with green beans. The Kimchi was fiery, sour, and not too pungent (most are sanitized for the American palate), the eggplant and broccoli were still slightly crunchy with a sesame oil note (my friend enjoyed this), the cucumbers were fiery and slightly sour (loved it), and the marinated potato was really flavorful due to a sweet soy marinade. I could have eaten the whole plate alone but I had to share (drats). We requested another plate after we polished this one off quickly. Our brunch platter came in a long quadrangle plate with the different elements taking their proper place. As an attempt to bring in a non-Korean clientele and to provide a brunch menu, this platter has traditional dishes along with typical American brunch fare. 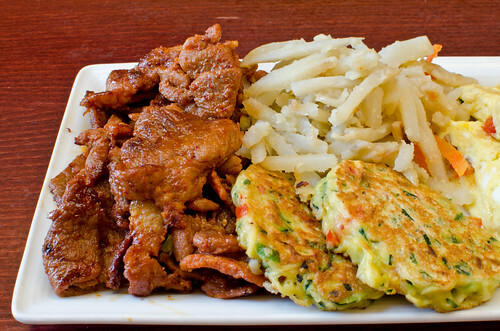 The traditional elements were a choice of Beef, Pork, Chicken or Vegetarian Korean barbecue, Gimbap (Korean vegetable-rice roll), Chive Pancakes, alongside the non-Korean hash browns and a vegetable omelette. The hash browns and omelette (real fluffy and light) were decent but nothing spectacular, the pancakes a bit gummy (most I have tried usually are) but tasty, the Gimbap roll was good and fresh, my order of Pork barbecue was full of flavor but not as fiery as I have had elsewhere, and my friend’s order of Beef was tender and had the customary sweet, salty, and dark flavors. Nothing particularly outstanding but good enough for me. 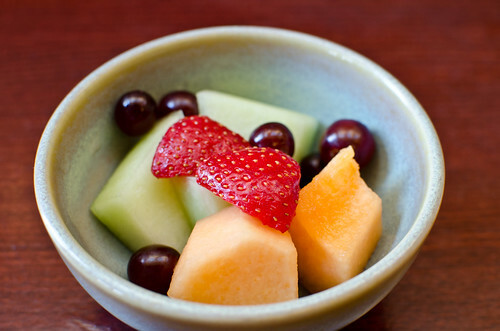 A bowl of fresh-cut fruits was the dessert offering that came with the brunch special. It looked very pretty, but the pieces of cantaloupe and melon were still a bit crunchy and not at their prime. But I can’t expect these fruits to be at their peak during a time when we have not approached Spring yet. However, it provided a good palate cleanser after the above dishes. 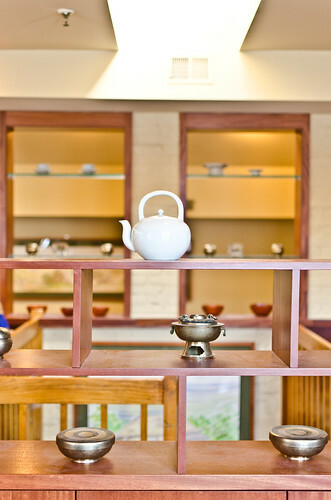 If you happen to be downtown and in the mood for Korean fare, Mandu has two restaurants (K St. and 18th St.) that will provide a casual modern ambience with good authentic cooking; this would save you a trip out of town and into the suburbs. The menu is quite extensive and its offerings sound appealing, especially the small-bites (Jeon) and the stew dishes. I see myself making another visit in the near future.